Despite the glut of new TV shows that’s come to be known as “peak TV,” it’s rare that a work manages to come across as truly distinctive. Although they often tweak the formula, many series stick to recognizable premises—family sitcoms, Breaking Bad-esque crime dramas, fantasy or sci-fi explorations. That’s what makes the overdubbed, propaganda-steeped ‘80s cop show Comrade Detective such a breath of fresh air. Like many great ideas, the concept for Comrade Detective came about almost by accident. The series’ writers and co-creators, Brian Gatewood and Allessandro Tanaka, knew they wanted to dub over a foreign show in the vein of films like Kung Pow: Enter the Fist or Woody Allen’s Tiger Lily, but they weren’t making any progress. “We looked at global television to see if there was a show to dub. In the fashion of the old way we used to dub Japanese films and all that. What we found is that we couldn’t get any of the rights to anything,” Gatewood recalls. The two kept digging, however, and their efforts were rewarded when they stumbled upon a documentary about an entire genre of television the Western world had missed. It didn’t take long for Gatewood and Tanaka to become fascinated with these Soviet-era TV shows. While the West devoured endless films that Gatewood describes as “America is great, the Soviet Union is evil,” the very same thing was happening across the Iron Curtain—but in reverse. Immediately, the two saw the potential in bringing this virtually unknown genre to Western audiences, but as had been the case with everything they’d looked into to that point, they weren’t able to get their hands on the Cold War relics, no matter how perfect their finds were. While dubbing a pre-existing show would have gotten the job done, Gatewood and Tanaka quickly realized they’d have more freedom if they created their own series and overdubbed that. 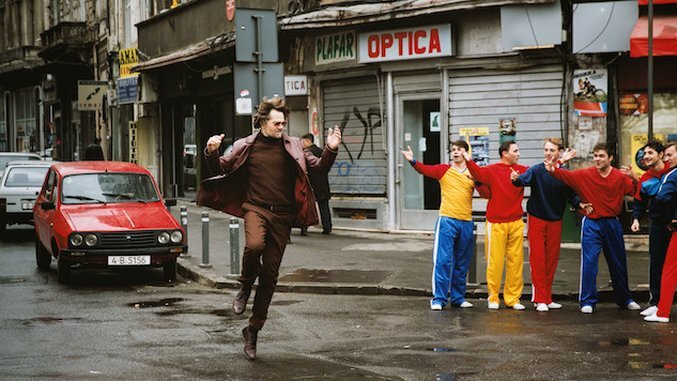 The pair didn’t want Comrade Detective simply to be a satirical remake of what had come before: They wanted it to feel synchronous with late-Cold War Romania. To that end, the series is presented as a long-lost Romanian cop show that’s only recently been recovered, restored and overdubbed for Western release. This was the idea that immediately intrigued Channing Tatum, independent production company A24 and director Rhys Thomas. But if they were going to make their own, original Romanian show, they couldn’t just cast Will Ferrell in the lead and start rolling. They needed to make it feel authentic. So they went straight to the source. “The entire production is Romanian,” Thomas explains. Other than a British director of photography—and the writers and director—the entire cast and crew are comprised of Romanians. In fact, the show is so true to life that the whole thing could be watched without any overdubbing. “We actually cut the entire show in Romanian first,” Thomas says. “If you squint, you could mistake this for an actual a Romanian show from the ‘80s,” Gatewood adds. The creators all believed creating a real product was essential to selling the series’ uncommon humor. To sell that “real story,” Tanaka estimates that “95%” of the overdubbed English mirrors what was originally recorded in Romanian. When the script deviates, it’s only to account for normal translation issues that stem from the differences between languages. This is what makes Comrade Detective so compelling: At no point does it feel like some obvious American parody. The series gives the impression we’re unearthing a TV program from bygone age—a reasonably coherent thriller made by semi-competent propagandists. Despite the ludicrous concept, the majority of the series is played straight. With real conviction the show’s characters deliver lines that could’ve been ripped from Marxian literature. The greatest threat to the lead detectives isn’t guns or knives so much as the seductive allure of American capitalism. Their struggle is ideological, and the show’s comedy comes from ridiculous, forced allusions to the greatness of Communism or the horrors of its ideological opponent. When head detective Gregor Angel investigates a potential break-in at his murdered partner Nikita’s apartment, for instance, Angel remarks that somebody must be “trying to redistribute Nikita’s wealth.” When asked if a fellow police officer could be corrupt, it’s immediately discounted because “There’s no such thing as a corrupt police officer in Romania.” A major plot point has the detectives interviewing “subversives” to better understand the board game “Monopoly.” Though they find its capitalistic nature appalling, they play the game anyway so they can “think like Americans” and crack the case. Despite all the mockery, Comrade Detective doesn’t exploit or abuse Romanians to generate laughs about their history and culture. In fact, to the writers’ surprise, the native crew was on board with the series’ central conceit. Too often, Romanians are forced to view their history in negative, bleak tones. Comrade Detective gives them the chance to have some fun with their past. Thomas—an admitted James Bond fan himself—agrees with Gatewood, though he also points to the endless possibilities that come with Comrade Detective’s satirical bent. Though the series begins with a niche premise, as with all great comic set-ups it offers myriad directions for the show to go in next. “I mean, I’m a registered Communist,” Thomas fires back. Like all true supporters of the party, he’s loyal to the end. Comrade Detective is now streaming on Amazon Prime. When Jordan Breeding isn’t writing for Paste, his work can be found on many other sites like Cracked and, technically, Twitter. His band is also on Spotify if that’s something you’re into.